Invisible network will handle phone rails, telegrams, television, FM and AIM broadcasts, complete newspapers—even carry your mail. COMMUNICATIONS are being revolutionized faster than you think. The humming wires beside the highways already are rivaled by new systems, capable of transmitting more spoken or written words and more still or moving pictures from coast to coast. The difference between these new systems and those of the past is as great as that between oxcarts and stratoliners. Radio relay systems, coaxial cables, and other improvements in communications systems soon will bring you not only better, faster services such as you already know, but also completely new kinds of service. Your radio program now comes to you in waves a fifth of a mile long. Your son’s television program, and his telegrams and long-distance phone calls—even his mail-will come to him in waves only two or three inches long. Telegrams are now flying between New York and Philadelphia in these microwaves; phone calls will be made in microwaves next year between New York and Boston; and television shows are being sent this way now from New York to Schenectady and Philadelphia. These microwave relays use invisible beams in the air instead of wires. No poles support them. The poles and wires are replaced by steel or concrete towers every 30 miles or so. On these towers are antennas that catch the microwaves, shunt them down to repeater equipment to be amplified, then send them on to the next station. These relay stations are as automatic as electric refrigerators—designed to operate with only occasional human supervision. If a tube fails, its duplicate is standing by, ready to switch into operation immediately without interrupting service—and at the same time to flash a trouble signal to the nearest testboard. A furnace heats each tower building in winter and in the summer it is cooled by air-conditioning devices for the machinery’s benefit. Banks of batteries and current from the local utility companies supply the power. In some stations, a gasoline generator automatically starts itself and takes over the job of charging the batteries if the utility lines fail. You will not notice any difference when your phone calls begin to go through these radio relays. On a call from New York to Boston, for example, your voice will travel as usual from the handset through the switchboard into a trunk line for Boston. That trunk line now is a thick copper, rubber, and lead cable buried in a ditch along the Atlantic coastline. When radio relay is used, however, the cable carrying your voice will end on the roof of the telephone building in lower Manhattan. There it will feed into a microwave transmitter, aimed at the first relay station atop Jackie Jones Mountain, N. Y., 35 miles away. At Jackie Jones, a strange antenna that looks like a big square metal funnel will receive the beam. This antenna is a set of criss-crossing metal plates that focus microwaves into a narrow beam. From this lens, the beam will travel down into the tower to amplifiers, to be strengthened after its 35-mile trip. It will then go back up to a second lens, which will aim it at the next relay station on Birch Hill in Connecticut. This process will be repeated in each of seven relay stations until your voice reaches the receiving lens on the Boston telephone building and goes into wires again. The Bell System already has the equipment installed for this New York-to-Boston chain of relay stations and is working on chains from New York to Philadelphia and Chicago. These relays will be capable of handling television shows as well as phone calls. 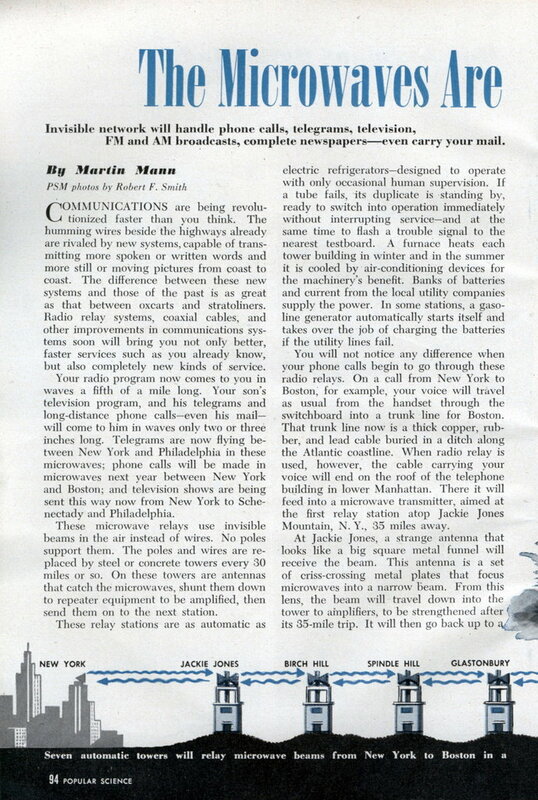 Western Union now is using a radio relay system developed by the Radio Corporation of America between New York and Philadelphia, will soon send telegrams from Pittsburgh to Washington the same way, and expects every main telegraph route in the country to be a radio relay system within a few years. The General Electric Co. is now transmitting television shows from New York to Schenectady, and the Philco Corporation has a similar link between New York and Philadelphia television stations. The beams transmitted and received by the relay stations are so narrow that it would be difficult to tap them. This is one of several reasons for using extremely high frequencies (around 4,000 megacycles, several thousand times as high as those of ordinary broadcasting stations). At such frequencies, the energy can be focused into beams so narrow that 100,000,000 times as much of it reaches the receiver as would otherwise. Most microwave transmitters produce only one watt of power, as compared to the 1,000 to 500,000 watts scattered by lower frequency radio stations. Microwave beams, moreover, are not bothered by sunspots, thunderstorms, man-made electrical interference, hail, sleet, or snow. Since the towers are always on hills, even floods will seldom cause trouble. But the big reason for high-frequency beams is their tremendous carrying capacity. Several hundred people will be able to talk at the same time over Bell System’s New York-Boston beams. Radio relays, however, are not the only means of increasing the capacity of a communications system. Much further developed than radio relays for telephone service is the coaxial cable, which is basically a copper tube with a wire running down the center. “Coax” already is being used both for telephone and television service. The cable must be buried in a deep ditch, and many amplifiers are needed, but the Bell System’s experience with coaxial cable has been so gratifying that more of it is being laid rapidly. By 1950, 12,000 miles of such cable will have been laid to link practically every major city in the United States. The ability of radio relays and coaxial cables to carry more traffic will solve the major problem of the communications companies: how to handle more business. The wire networks have been called upon to carry an ever-increasing load of phone calls and telegrams. On top of that, there are new kinds of business that will not fit well on the wires—television, FM, and high-speed facsimile. Existing wires will continue to be used for comparatively short-distance phone calls and telegrams, but the burden imposed by the addition of new services will be handled largely by the new systems. Television is the greediest customer. A television show can be sent over ordinary wires, but many amplifiers are needed and a coast-to-coast hookup by such wires is impractical. Even microwave equipment at present will carry only one television program per channel, because that is all the amplifiers can take. 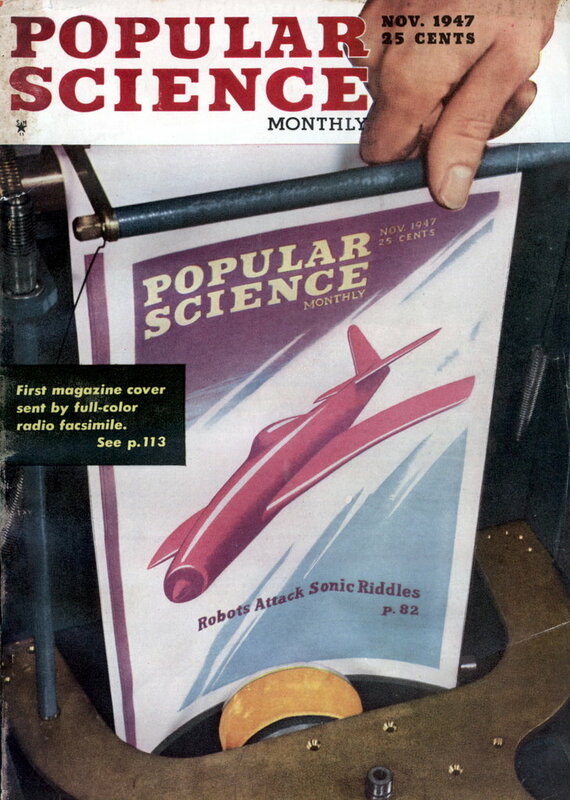 Better amplifiers, like the traveling-wave tube (PSM, Nov. ’46, p. 111), are being developed, however, and may increase the capacities of microwave systems. Already, too, scientists are working on another kind of wire that possesses almost limitless carrying capacity—wave guides, which are just what the name suggests: copper pipes that guide waves. In a wave guide, the radio wave travels in the empty space inside, not in the copper itself. The copper serves only to hold the wave in place. Engineers call the waveguides “plumbing” because they look and work like the water pipes in your home. Waveguides already are being used in radio relay stations (and radar sets, too). They carry the microwaves the few feet from the receiving antennas to the amplifiers and back to the transmitting antennas. Waveguides promise to be the ideal means of communicating intelligence when present difficulties are ironed out. A single pipe could carry all of the communications between the Atlantic and Pacific coasts. It could take every phone call and telegram now handled by hundreds of wires and still have plenty of room left for television, FM, and facsimile. As a long-distance path for communications, however, waveguides are still in their infancy. Networks of some kind, capable of delivering television and FM service to every home in the country the way wire networks now carry standard broadcasts, will be avail-able in the very near future. They will also make possible such spectacular services as radio mail, a system of high-speed facsimile which may replace telegrams and air mail by speeding your letters across the continent at the rate of a million words a minute. Radio mail equipment is being perfected now by RCA and Eastman Kodak under the name of Ultrafax. This equipment will combine photography and television to flash any kind of written material over a great distance almost instantaneously. Letters, books, newspapers or what have you will be first photographed on motion picture film. The film then will pass before the lens of a special television camera that will convert it to a radio wave and send it over a microwave relax or a coaxial cable to a distant receiver. There an electron beam will “write out” the material on unexposed film. After fast processing, this film will reproduce the original. David Sarnoff, RCA president, says Ultra-fax will be capable of sending 40 tons of air mail from coast to coast in a single day. Besides letters, Ultrafax will be able to send newspapers over the air, perhaps even in the middle of regular television broadcasts. E. K. Jett, of the Federal Communications Commission, suggests that Ultrafax might be used to transmit a whole issue of the New York Times from New York to San Francisco during the few seconds between programs. The screen on a home television receiver would darken while the announcer said, “This is WNBT, New York,” and in that instant the picture frequencies would be used to send the whole newspaper. With the help of modern, high-speed methods of reproduction at the receiving end, San Franciscans could get their copies of the Times as soon as New Yorkers! It took several decades to get e mail working. On the other hand, microwave ovens caught on much sooner. The microwaves came… and went. I’ve got one of those microwave towers about a mile from my house. On New Years Day I hiked up to it and discovered that sometime over the last few years all of the feedlines had been removed and the facility decommissioned. All of the telephone communications are routed by fiber optic or satellite these days. I remember seeing the orange horns on a tower on a mountain in the distance. 60 miles from NYC. 1960s? Microwave towers might be slowly becoming obsolete, but what do you imagine the satellites are using to transmit and receive data…? Some did, but most of the microwave towers weren’t repurposed into cell phone towers because the two systems had basically opposite intentions. Microwave towers were put on the tops of high, usually remote, hills so as to maximize the length of the link (fewer towers per city-to-city link = lower cost). Covering wider areas for a cell tower is counterproductive, which is why you’ll often see them in valleys or hillsides rather than on top of mountains. The whole point of the “cell” in “cell phone” is to allow reuse of the same frequency in relatively local areas by limiting the range of each cell. > but what do you imagine the satellites are using to transmit and receive data…? Satellites do use frequencies in the microwave spectrum. I think the “microwaves” of the title referred to the terrestrial microwave tower network which did, eventually, span huge parts of the country, rather than the frequency spectrum itself. @Mike Brown: Some of those microwave towers and immediate property (buildings, land, etc) can be purchased by private citizens fairly cheaply. I remember checking it out a few years ago – there’s a few real-estate agents that specialize in this kind of property (as well as decommissioned nuclear silos and/or bunkers). Though their remoteness doesn’t make them great places for living (although, perhaps perfect for a mad scientist lab!). Here in California there are lots of cell towers that look like fake pine trees. They’re gawd awful ugly. I would prefer that a cell tower look like a cell tower! My ISP uses microwave towers, microwave communications is also used by news agencies and the military…the technology is far from dead.